Come and join the party and hear from the winning entries in the 2017 British Sign Awards. We celebrate the best in class in wayfinding with presentations from two of the shortlisted projects in the 2017 British Sign Awards wayfinding category. We will hear from Populous Activate and their impressive work on the Groupama Stadium in Lyon. At the other end of the spectrum, Maynard will tell us about Paddington Portable. A mobile scheme, inspired by the eponymous bear and tasked with promoting events and exploration in this strategic regeneration area in London. 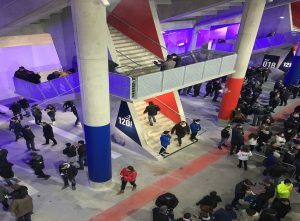 Populous Activate were awarded best wayfinding project for their work on the Groupama stadium (pictured). The wayfinding and signage had to give people the freedom to enjoy the events hosted by the 59,186-capacity stadium, without visitors being troubled by navigation. The overarching approach to signage was to use big target signs that, in the first instance, could be painted directly to target functions or, where necessary, could be integrated harmoniously with the surroundings. Simon Borg will be discussing the integration of the signage graphic systems into the architectural expression of the building. Maynard achieved success with their fabulous Paddington Portable Event Signs project. The project is an example of contextual placemaking; making subtle reference to the local area as it raises awareness and sets it apart from standard totem signs. Julian Maynard will talk about the mobile signs, positioned at key gateways and throughout the site, which support the wider ongoing marketing campaign to draw more visitors and customers into Paddington. Simon Borg is the Creative Director and an Associate Principal at Populous Activate, a specialist brand activation and user-focused experience design agency working within the sports and entertainment sector. Simon has lived and worked in both Melbourne and London, developing a range of projects from interpretive and wayfinding programs for cultural and entertainment venues, through to branded environments and naming rights activation programs for stadia and arena across Australia, Europe and the Middle East. Julian Maynard studied Industrial Design at the Royal College of Art and is a Fellow of the Chartered Society of Designers. He started his career at Grimshaw working on Waterloo International Terminal and then set up a team with Roland Paoletti to design the linewide products for the Jubilee Line stations. He is the founder of the design practice, Maynard, with studios in London, Melbourne and Auckland. They are currently working with TfL, Crossrail, JLR and City of Melbourne. This talk is free for SDS members and £25 for non-members. All tickets include wine, soft drinks and a buffet. Anyone wishing to attend, must email enquiries@signdesignsociety.co.uk to register. Please note: This event will be livestreamed and available to SDS members via our SDS Live Facebook account.